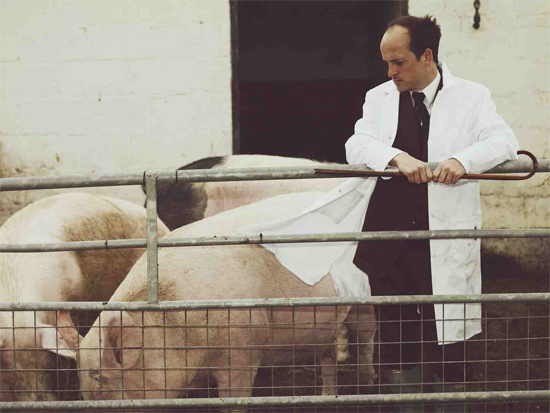 Matthew Herbert is to host a special evening of music, art, discussion and food at London’s Café Oto on 15th December, following the release last month of his One Pig album. The night is titled One Pig, Dead And Alive and marks the official launch of One Pig, an album composed entirely of samples of a single pig's journey from womb to plate. It follows on from his recent, thought and appetite-provoking performance of the album at the Royal Opera House. When we interviewed him recently, Herbert said that the album was a reflection of the “the drama and the melancholy of nurturing animals to slaughter them to eat." The evening will begin with a short debate between Herbert and some yet to be announced guests, before following on to a performance of One Pig that will be centred around a new instrument called the Styharp, specifically designed to play and manipulate the samples used on the album. But wait, there’s more! After the performance attendees will sit down to a delicious three course meal, offering pork from the One Pig’s own family among other delectable dishes. When we asked Herbert about the effect the record had on him he replied "I think there's something really empowering about removing something from your diet. It felt like a logical extension of what I was doing. Since I finished the record I haven't eaten pork." If you’re willing to take the chance of forever ruining your enjoyment of pork derived meat products, then you can buy tickets for the evening here.